by Leopoldo A. Sánchez M.
The song goes that, after Deuteronomy, Isaiah is the most monotheistic book in the Old Testament. The confession of faith that the Shema (“Hear O Israel, the Lord is our God, the Lord is One”) sums up reminds the people of Israel that there is only one God who deserves their worship, namely, the Lord who saved them from the hands of their enemies. In the great exodus of old, the Lord displayed his mighty power against Pharaoh to deliver Israel, whom he had chosen out of mercy as his son. With Isaiah, the monotheism of the Old Testament—firmly rooted in the experience of the exodus event—takes on a more pronounced universal eschatological orientation. The same Lord who delivered Israel from Egypt in the waters of the Red Sea will deliver the nations from darkness and iniquity through his servant’s suffering and exaltation. It will be a new exodus on a different scale. Not only Israel, but all the nations will know that the Lord is the only God. But such knowledge of God’s salvation is not accessible apart from his servant upon whom the Spirit rests. Isaiah’s eschatological monotheism finds its fulfillment in Jesus, who is anointed with the Spirit to be our servant, to take upon himself our iniquities, to be a light unto the nations. If Jesus alone can deliver us, then he must be God—one with Yahweh. So we see NT writers ascribe to Jesus what Isaiah would only say of Yahweh. Jesus is the beginning and the end. Every knee shall bow and every tongue shall confess that Jesus is Lord. The new exodus has come to us in Jesus. The Savior is Lord and God. 304It is in this framework of the history of salvation, with Jesus at the center of the new eschatological event, that the text from Isaiah should be read. In psalm-like fashion, the writer begins with an eschatological picture of God’s mighty power and judgment, which soon leads to a confession of one’s sins before the Lord and opens the door to plea for his fatherly mercy. The Lord comes down from the heavens, the mountains quake at his fiery presence, and the nations tremble—fire and fear. The Lord has come to judge and reveal his power before Israel and the nations. The same acts of the Lord can be seen at once as judgment and salvation. The waters of the exodus mean judgment for Pharaoh and his armies but salvation for God’s people. The suffering of Yahweh’s servant is condemnation for those who do not believe but eternal life for those who believe. The Lord, who comes down and makes the nations tremble, is also the one who acts on behalf of his people, mercifully meeting him who joyfully works righteousness and remembers his ways. The text also places God’s people on the side of sinners. God’s son, Israel, whose unfaithfulness is well-known in the Bible, knows his sins all too well, that he deserves the wrath of God (v. 6). God’s judgment against sin is deeply felt. It is also an opportunity for confession. So the life of God’s people is one of repentance (v. 7). Help in the struggle against sin cannot come from within (v. 7b). Confessing one’s sin is a practical affirmation of the Shema. It lays on the table one’s idolatry, one’s rejection of the Lord’s ways. Sin reveals our practical polytheism, our false worship. Now, the son Israel also acknowledges that only the one who saved his people from Egypt can rescue him from his enemies, so the unfaithful son calls out to his father for deliverance from iniquity (v. 8). Only the Father, who created for himself a people and chose Israel to be his son out of mercy, can hear his plea (v. 9). Confessing one’s sin is an eschatological affirmation of the Shema. It not only acknowledges that God can absolve us of our sins, but also expects in hope to receive such forgiveness from him. That is the evangelical side of the coin. In the new exodus, Jesus, the faithful servant-son, is our salvation. God is not finally a wrathful judge, but a merciful father. We can hope for a new day. Jesus makes this clear to us, revealing the depth of the Father’s love for us. The text is an invitation to repentance. The words of Israel—his reverent fear of God and his mighty acts, his lament and hope in God’s deliverance—become ours today. The preacher can move the hearer of the psalm from the reality of divine judgment to the need for confession of sin and from the reality of fatherly mercy to the gift of absolution. 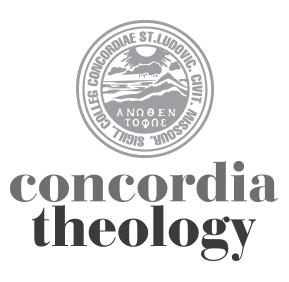 Leopoldo (Leo) A. Sánchez M. teaches systematic theology at Concordia Seminary, where he also holds The Werner R.H. Krause and Elizabeth Ringger Krause Chair for Hispanic Ministries and serves as Director of the Center for Hispanic Studies. Among his research interests, Leo writes and teaches in the areas of pneumatology (Holy Spirit), Spirit Christology, sanctification, Trinitarian theology, and issues related to U.S. Hispanic/Latino theology and missions (such as immigration and other societal issues affecting Latino/a communities) and contemporary Roman Catholic theology.